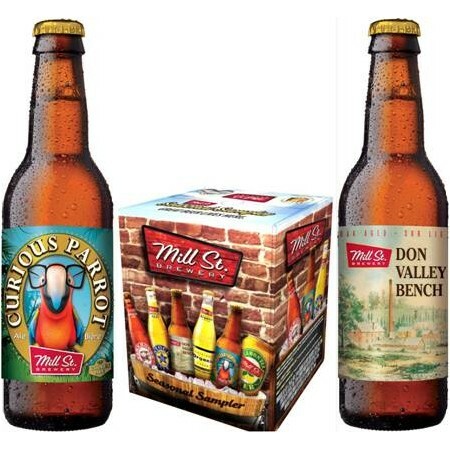 TORONTO, ON – Following on a few tweets last month that revealed its contents, full details of the latest seasonal sampler pack from Mill Street Brewery have been announced. Moving away from the two brand 6 pack format that has been in use for recent samplers from the brewery, the new release features six Mill Street products. Two new beers – Curious Parrot, described as a “thirst-quenching blonde ale inspired by the golden ales of Hawaii; and Don Valley Bench Estates Ale, which is a “chardonnay-like beer made only malt, hops, yeast and water but bursting with fruit and herbal flavours” – are exclusive to the package. Also included in the mixed 6 pack are four of Mill Street’s year-round brands, including Organic Lager, Stock Ale, Lemon Tea Ale and Tank House Ale. The Mill Street Summer Seasonal Sampler is being released this month in BC, Alberta, Ontario, Nova Scotia, Newfoundland and Prince Edward Island. NOTE: An earlier version of this article incorrectly listed this package as a 12 pack. It is actually a 6 pack.